UESP does all it can to keep costs low so we can be financially accessible to as many families as possible. That’s why UESP has reduced one fee and eliminated another. The annual Administrative Asset Fee for all predetermined age-based investment options and five static investment options was lowered to 0.16 percent from 0.17 percent, a savings of 10 cents per $1,000 invested, as of July 1, 2017. 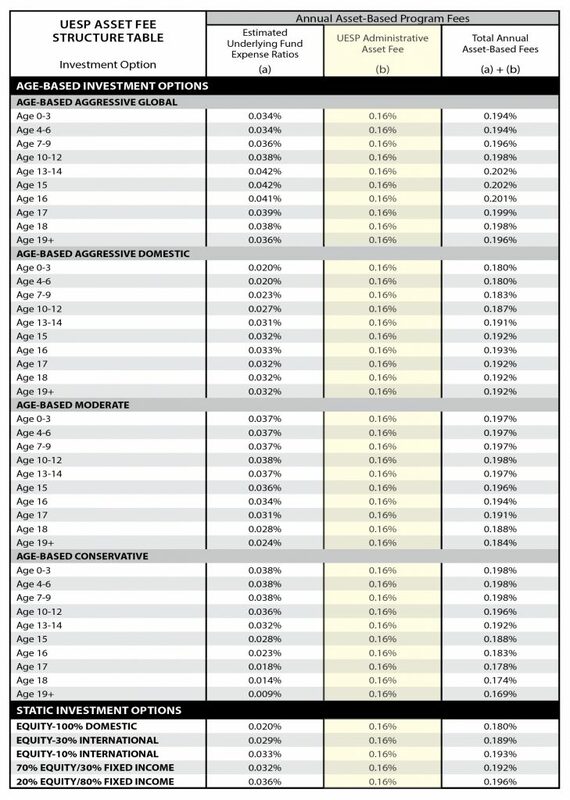 Please refer to the UESP Asset Fee Structure Table below to see the age-based and static investment options affected by the reduction. The annual Administrative Mail Delivery Fee was eliminated as of July 1, 2017. The fee had charged $2 per $1,000 of account balance and was capped at $12.